Britain’s specimen anglers have enjoyed a spectacular end to the river season topped by a massive 4lb 10 oz perch. Oxfordshire ace Ryan Hayden kicked off a flurry of stunners when he slipped the net under the immaculate fish (pictured right). 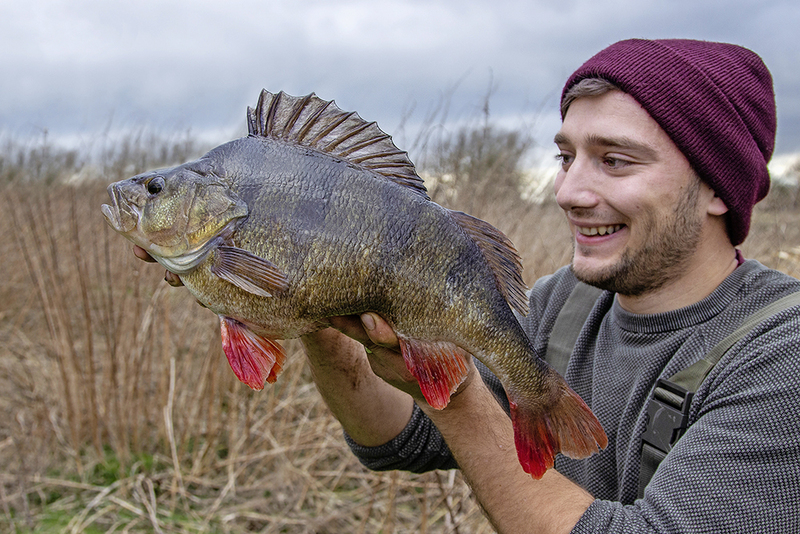 The 26-year-old didn’t think his session could get any better after landing a 3lb 4oz perch from a Midlands river... until a change in tactics tempted the huge specimen. “After bites dried up on lures I switched to a link-legered lobworm and the 4lb 10oz perch took the bait within five minutes of casting,” he said. “I’d introduced plenty of lobworms and maggots to help keep the predators and small silver fish feeding in the area – and it worked. “When the four-pounder popped up within netting range my knees turned to jelly! “It’s my biggest-ever river perch and a new personal best that I’m incredibly proud of. Ryan’s winning set-up consisted of 6lb mainline, a 1oz fast-taper glass tip for sensitivity and a size 4 wide-gape hook to ensure a firm hookhold.